UPDATED: Wed., Feb. 6, 2019, 6:45 p.m.
NCAA D-I leaders in 3-point percentage this season. When you’re among the best long-range shooters in college basketball, expectations can get a bit surreal. So can the postgame conversations. After a recent 2-for-5 night from beyond the arc, Gonzaga guard Katie Campbell called her father in Los Angeles. She expected some sympathy after an “off” night. Instead, she got a reality check. Good enough for most players, that is, but not when you’re hitting almost 50 percent from beyond the arc. Going into Saturday’s game at Portland, Campbell is hitting 47.5 percent and ranks fifth in the nation. “I’ve set the standards so high that when I’m not meeting them, I get down on myself,” Campbell said. The occasional slump also offers Campbell – whose ambition is to be a sports psychologist – a chance for some self-analysis. Perhaps one day she’ll write a book on the subject: “The Psychology of the 3-point Shooter,” with chapters on streaks, slumps and sudden fame. She may also write about toughness, especially her own. A touted recruit at Oaks Christian High School in Westlake, California, she took an official visit to the Inland Northwest – at Washington State, not Gonzaga. Then life changed. Midway through her senior year, Campbell learned she was pregnant with her daughter Ava. She responded by winning league MVP and first-team all-state honors. While four months pregnant, she scored 23 points in a state tournament game. By the time Ava was born in the fall of 2016, Campbell had backed away from her commitment to WSU but had enrolled and was playing at two-year Ventura (California) College. Despite having “all the support I could want” from her father, Howard, she worked up to 40 hours a week at two jobs. “I didn’t want to rely on him for everything,” Campbell said. She also managed to average 18.5 points a game at Ventura, but wanted more. So did Gonzaga, which needed a shooter after Zhane Templeton transferred home to Texas-Arlington. The match was pure happenstance, the product of old ties and new friends on social media. As it turned out, Campbell’s coach in middle school was George Albanez, the father of former GU player Keani Albanez. By then a professional in Greece, Albanez let it be known via Twitter how well Campbell was playing at Ventura. Meanwhile, Campbell had been sending out “random texts” to GU assistant Craig Fortier, and things moved from there. By May 2017, she was signed to play for the Zags. “I wanted to put myself and Ava in the best situation, get a better education and further my basketball career,” Campbell said. “People had nothing but good things to say about her,” coach Lisa Fortier said. “And we didn’t have any questions about Katie’s character. “Plus, if there’s a place with a family atmosphere that could help her, it’s Gonzaga. The GU family had done this before for a single mother, with former West Valley star Shaniqua Nilles and her daughter Nevaeh. “They’ve been through this, and that really helped me make my decision,” said Campbell, who also was impressed by the Fortier family, including Lisa, Craig and their three young children. “I like how they have three kids and still work tons of hours,” Campbell said. They also know how to play. On Jan. 26, the program celebrated Alumni Day with dozens of players and their children. “It’s really fun and makes me smile,” said Lisa Fortier, who has spent the last 12 years at GU. For the Fortiers, the event was a trip down memory lane with former players who now have their own children. Now Campbell and her daughter are part of that. On the court last year, Campbell played in 29 games, but like many Zags struggled with her long-range shooting. Campbell didn’t elaborate on the difference between shooting baskets in California and Washington, but her point was well taken. “I just had to get more confidence,” Campbell said. She found it immediately, making 18 of her first 39 long-range shots. Then came the biggest game of the year, against eighth-ranked Stanford. Campbell took six shots – all of them 3-pointers – and made five to stake the Zags to an early led that stood up for a 79-73 win. Five-foot-10 and rail-thin, Campbell also grabbed seven rebounds and made a pest of herself on defense. A backup when the season began, Campbell became a starter when point guard Jessie Loera went down for several games with a concussion. 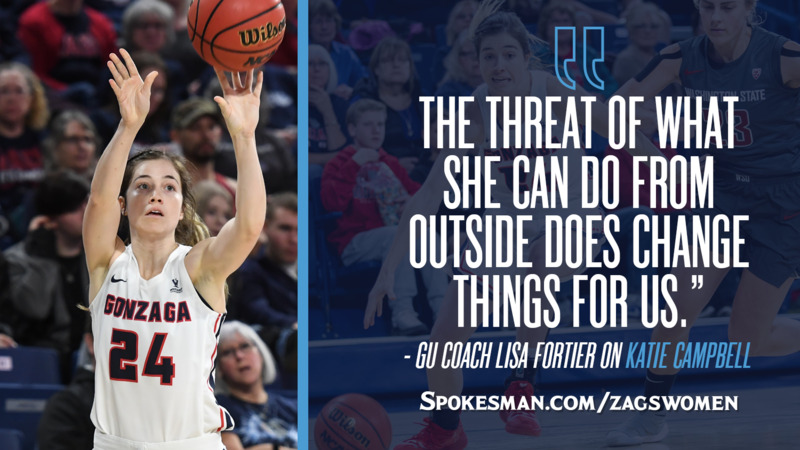 “She’s a lot more than a shooter, and defensively she’s often guarding the other team’s best player,” Fortier said. Published: Feb. 6, 2019, 5:38 p.m. Updated: Feb. 6, 2019, 6:45 p.m.